So, why is the whole argument over whether Naru knows about Usagi being Sailor Moon so complex in the first place? I mean, it sounds pretty straight forward when you pitch it like that. The other major issue that makes answering this question a nightmare is that, absent any official statement from either Ms. Takeuchi or the anime staff, we frankly have no idea what the characters are actually thinking. Any argument can easily degrade into “Well, maybe she was just faking it!” and there’s really nothing you can do to counter that. So for the sake of my own sanity, I generally take what characters say at face value, unless they have an obvious reason to lie. 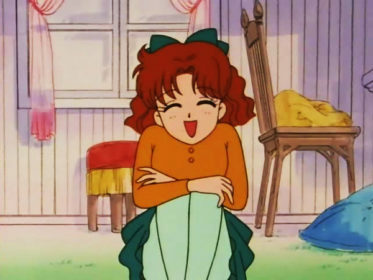 So, does Naru know that Usagi is Sailor Moon? Let’s take these one at a time! I’m starting with this one because the answer is the most uninteresting: yes, Naru knows. Late in the series, in an episode aptly titled “Actually, I’m a Guardian!” (実は戦士なの！),3 Usagi is forced to transform in front of Naru in order to save her friend from an attacking Youma. Read also: Why Does Sailor Moon Heal Everyone? Frankly, there’s really not much to discuss about this one, so onto the manga! Did Naru know about the Usagi/Sailor Moon connection in the manga, then? I’d personally say “no,” due mostly to the fact that we don’t have any evidence to say otherwise. “You’d suspect…!” and “She has to notice…!” are nice and all, but that same logic can apply to every character in the series. One scene often touted as “proof” occurs in the first act of the Infinity arc,4 when a Mugen Gakuen student turns into a monster (daimon) right in front of Usagi and Naru’s eyes. Mamoru, ever willing to help but not actually do any real work whatsoever, dives into the scene and tells Usagi to leave Naru and Umino to him. In the next panel, Minako calls a “Thundercats — HOOOO!! !”5 and the Sailor Team transforms. Since it’s a manga, we can’t say how much time passes between one panel and the next, but I’m willing to give Mamoru the benefit of the doubt that he’s not totally useless and that he got Naru and Umino out of there before they saw anything. Naru also never brings this up (which you think would be kind of important), so I think we’re safe saying she’s still unaware. Finally, that brings us to the anime! 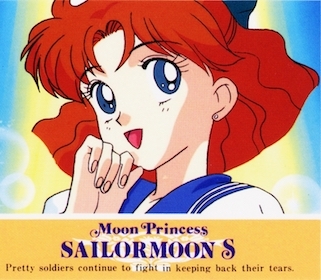 Naru actually started off as a major player in the original season, with fans even speculating that she may be the next Sailor Soldier, but her role continued to be cut down as the cast expanded, and our poor monster-fodder was left to fend for herself. So how about the anime? While I can’t say definitively, in my opinion Naru absolutely did know about Usagi. At the very end of Sailor Moon R,6 Naru confronts Usagi in the park as she’s on her way to meet up with the other Sailor Soldiers to face off against Prince Demande. The way their conversation goes, it’s obvious that Naru knows that something’s up and that Usagi is right at the center of it all. Naru: I knew it. You know what that thing is, don’t you? Usagi, if there’s anything I can do to help, let me know, okay? Usagi then tries to play it off like it’s nothing, and Naru responds that “we all have things we can’t talk about,” and that she “won’t ask any more questions.” As Usagi runs off, Naru looks up to the sky and prays to the heavens to protect Usagi and her friends. I don’t know about you, but I’d say that’s pretty solid evidence that Naru knows something, even if she may not know exactly what’s going on. 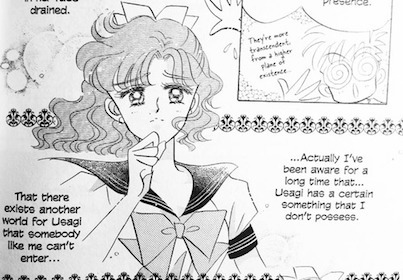 A scene similar to this also exists in the manga, but the nuance is much more vague in my opinion, and seems to suggest more that Naru senses a distance growing between herself and Usagi (possibly due to some big changes), but it’s nothing more than that. Of course, we don’t have any definitive answers on any of these (except for the live-action series, of course) and this is all open to interpretation. Personally, I feel reasonably comfortable saying that Naru doesn’t have any idea in the manga, while it’s a very strong probably in the anime for me. But maybe you have a different take of this scene, or maybe there are other scenes in the manga or anime that I’ve totally overlooked. So let me know what you think! 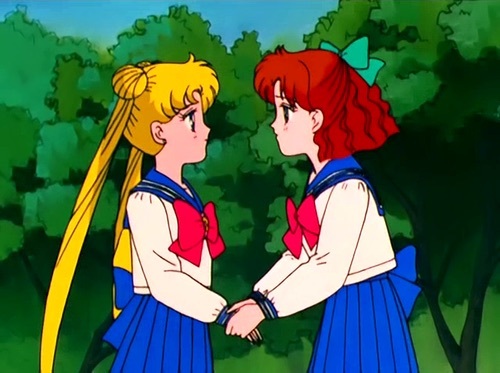 Is Naru really as clueless as we’re left to believe, or is she watching over Usagi like a dutiful friend? I’d love to hear your thoughts! ← What Are Some Rejected Tuxedo Unmasked Articles? Nice Article! Can you do more articles about Sailor Mars or the Sailor Senshi? Not sure exactly what you’re looking for, but I do have a list of articles covering everything I’ve written about each specific character. If you have a specific question about a character, though, I’d be happy to see if I can find more information! I’m only familiar with the anime, but related to the discussion above, what the heck happens to Naru? She completely disappears towards in the latter part of the show! It’s a shame, isn’t it? =( Unfortunately, this happens to a lot of the characters (including Usagi’s family!) as the cast expanded to include more Sailor Soldiers. Starting with Sailor Moon S, it seems like a lot of characters got cut from the story. Is’t it because of director/scriptwriters change in S? I agree with you there, one thing that makes Stars my least favorite season is how weird felt. The writers used to make a point of having recurring side characters like Naru, Umino, Yuichiro, Ikuko, Shingo, Kenji, and Rei’s Grandpa show up once in a while so the world they lived in felt more grounded. Mamo and Chibs get nixed from the story ): , Haruka and Michiru only show up occasionally, Setsuna and Hotaru BARELY show up in Stars’ second half (mainly because without Chibs they have no one to really connect with). It just cam,e off as a mess. All the attention goes to the Starlights so no side characters got any time for spotlight moments.